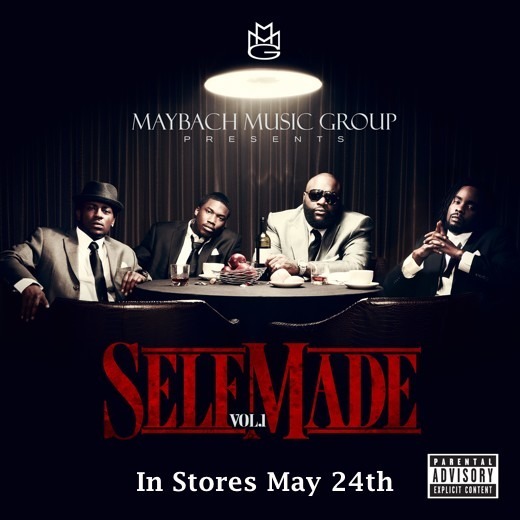 Like the fabled drug cartels of the Cocaine Cowboys era, the Maybach Music Group now intends set its mark and enforce it. Self Made Vol. 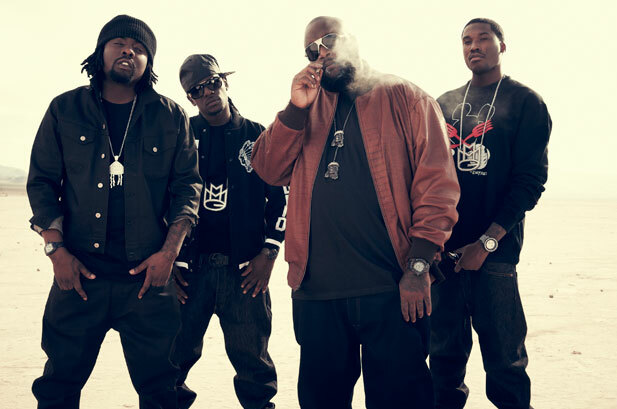 1 is a compilation showcase for all members of the council: Wale, Meek Mill, Pill and founding member Rick Ross. The album is largely what both fans and detractors have been expecting. Just Blaze ignites a sonic inferno with the title track. Blaring horns, church organs and buzzing electric funk guitars hack the hi-hat assisted drums to pieces. Meek Mill attacks the track aggressively but cannot wrestle it into submission. The closing is beautifully organized. The imposing tribute “Tupac Back” stomps along over a basic trap music composition courtesy of Mike Will and the Eardrummers. Meek Mill and Rick Ross slightly affect a Pac style cadence at certain points. The song is more loud than energetic and will appeal mostly to those who agree with the sentiment. The flossy trap style characterizes “600 Benz,” produced by Cardiak. All of the “trappings” are in place (pun intended): rolling percussion and hand claps, synthetic horns and strings. Guest star Jadakiss proves to be ever the chameleon, disappearing into the Maybach music aesthetic. Pill gets to do his thing over “Pacman,” which features Creepshow style synthesizers organized into a steadily coasting roll. The title is yet another clever metaphor for hustling and serving fiends. Producers Young Shun, DJ Spinz stay true to the sonic musical theme that has been established on the album thus far. Lil Kody affects an 80’s slasher movie score style for “By Any Means.” The drag racer tempo speeds along while haunting bells chime a disturbing melody. Musically it’s not too different from what has come before, but it has a bit more oomph. The title of course refers to the slogan made famous by Malcolm X.
Cardiak sits in the producers chair again for “Rise,” a lovely sample laden change of place. Serene Strings and tambourines coast along on a nighttime vibe. They are undercut by an incessant low fidelity hum that sounds like foghorn. The combo makes for a hypnotic blend. The infamous Lex Luger offers an uncharacteristically soothing backdrop for “That Way.” It’s built atop a sample from Curtis Mayfield’s "Give Me Your Love (Love Song)" from the Superfly Soundtrack. Jeremiah’s hook is well placed and executed. The suitably loud and declarative “I’m a Boss” sounds like it could have been taken from the musical score of Rocky IV. It’s 80’s synthesized ambience comes courtesy of Jahlil Beats. “Don’t Let Me Go” incorporates the down home sounds of church music, outfitting them for the whip. It’s good traveling music, complete with organs and sped up choral singing. The lyrical content isn’t as spiritual or as reflective as the music demands. The Lush and filling “Runnin Rebels” closes the album admirably, with its quartet of hustlers bowing out triumphantly. Though the album is meant to feature the artists of the Maybach Music Group, the star of the show ends up being the production itself. Like a summer blockbuster that exists for the sake of the special effects, Self Made Vol. 1 dazzles the listener with its technical prowess. More than a few times, the vocals succumb almost completely to the beats, making their relationship to each other one sided. The beats aren’t quite as disorganized or annoying as garden variety trap music, yet they are undeniably repetitive. 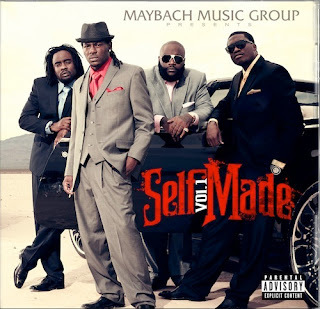 The production alone makes Self Made Vol. 1 a worthy purchase, but it is decidedly style over substance. Rick Ross and company can hardly be lambasted at this point for their flossy and romanticized portrait of the dope game. That’s what Ross is known for, and that’s what his fans want from him. Yet, the combo of hackneyed subject matter and synthesized production makes the proceedings feel rather soulless. Though well executed, the album likely won’t connect with listeners who are looking for something a bit more substantial, but it can’t be argued that Ross and company didn’t deliver what was promised.